The NEC SL1100 phone system can grow from 4 incoming line X 8 digital station ports X 4 analog station ports for single line phones or fax machines and expands to a maximum of 120 extensions of which 72 can be multi-line terminals. The system can be expanded to a maximum of 36 analog trunks, 48 PRI/T1 trunks, or 32 (SIP) trunks. The actual expansion depends on the number of KSU's and the type of PCB's installed. include Music on Hold Paging, VoIP, Caller ID, Auto Attendant, Voice Mail, Networking, remote programming and many other features are also available. Starter kits and system bundles available for the SL1100 that most any business can afford. Two digital phones are available for the NEC SL1100. A 12-Button and a 24-Button phone with display, speaker phone, back lit display, and built in wall mounting kit. 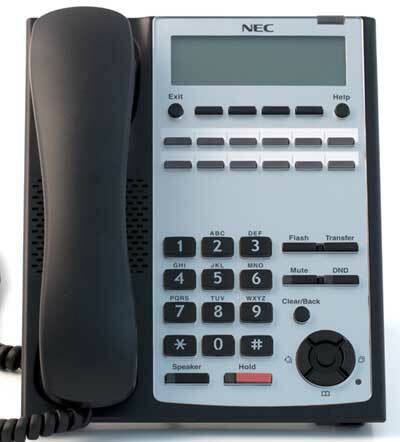 The NEC SL1100 supports what is known as VoIP extensions and SIP Trunking. VoIP Extensions are most cost effective when a phone or phones are needed at a second office location or an associates home. The VoIP extension connects to the phone system via the internet. SIP Trunking is a phone line with an associated phone number from a service provider that connects to the phone system over the internet. Additional expansion cards available to expand incoming lines, phones, IP phones, add a T1/PRI circuit, and a KSU interface card. Click here to find out how EZ the installation of an NEC SL1100 can be for a do-it-your-selfer with the appropriate wiring skills like the ability to make and terminate computer network cables.